The historic Shirt Factory, located between Lawrence and Cooper Streets, is a cornerstone of Glens Falls' arts and health communities. Although today the building is officially named The Shirt Factory Arts & Health Center because of its in-house studios and artists, the building is commonly referred to as just The Shirt Factory, which is what it was when it was established over 100 years ago. The story behind The Shirt Factory's construction is one of rebirth. Before The Shirt Factory existed, there was a different shirt company in Glens Falls called the Joseph Fowler Shirt and Collar Company. In the 1890s, brothers Joseph and Charles Fowler operated this shirt company on Glen Street. Two Glens Falls locals, James Robert "J.R." McMullen and Walter Leavens, joined the company as clerks in 1891 and learned about the shirt factory business. In 1897, McMullen and Leavens became members of the company's board of directors. After Joseph Fowler's death in 1898, the board of directors consisted of Charles Fowler, McMullen, and Leavens. A few years later, tragedy once again struck the Joseph Fowler Shirt and Collar Company. On April 23, 1902, a fire destroyed the company's building and other Glen Street businesses. Around 700 people were left unemployed from the shirt company, and the overall damages were estimated at $500,000 (or $14,000,000 today). Instead of leaving the industry behind after this unfortunate event, McMullen joined up with Leavens to continue on with the shirtmaking business by using the company's insurance money. The former Joseph Fowler Shirt and Collar Company was split up, and while Charles Fowler stayed with the collarmaking side of it, McMullen and Leavens established the McMullen-Leavens Shirt Factory in 1902, just a month after the great fire. The Shirt Factory was born. Rather than rebuild on Glen Street, McMullen and Leavens decided to construct a whole new factory building. For them, the prime location was right by the railroad depot at 71 Lawrence Street (known then as 51 Lawrence Street). This would provide easy access to materials delivered by train. The two soon purchased the property from Mary Ann O'Leary, and then they hired architect Ephraim Potter. While the McMullen-Leavens Shirt Company operated out of the third floor of the Robertson Building on Maple Street, Potter started to create the new building. Potter designed the factory as two connected buildings. A laundry building in the rear would provide 23,000 sq ft of space in the back, and a 3-story building would be on Lawrence Street. By 1910, another addition gave The Shirt Factory more of an L-shape, and the whole factory was 60,000 sq. ft. Upon completion, the McMullen-Leavens Shirt Company operated out of the 71 Lawrence Street building. 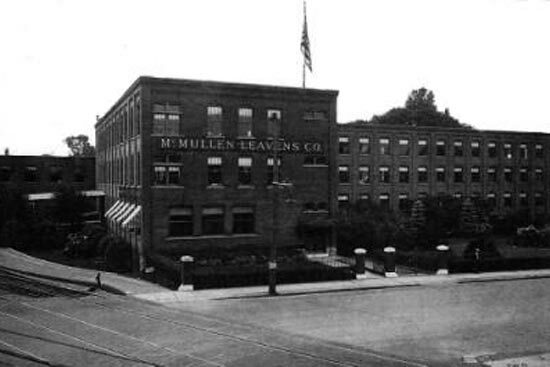 When Leavens passed away in 1922, McMullen became the sole owner. In 1936, McMullen expanded the company to keep up with a new trend, dressmaking. Dorothy Cox was hired as the company's lead designer, and she helped make the company's own dress patterns. Over 800 women employees worked for the factory at this time. Half worked out of their homes, while the factory-based workers used industrial sewing machines on an assembly line. The McMullen-Leavens Shirt Company was successful in the dressmaking industry, and they garnered a reputation for high quality and fashionable garments. In 1939, the dressmaking side of the company was large enough that McMullen purchased the "Troy Shirt Makers Guild" label for $1 to distinguish the shirtmaking and dressmaking sides. Both continued to operate out of The Shirt Factory on Lawrence Street. When McMullen suddenly passed away in 1946 without a will, it took two years to settle the estate. One group of McMullen's heirs took over the shirtmaking side while the other group took over the dressmaking. Dorothy Cox received much acclaim for her continued work as lead designer, but she left the company in 1952 due to conflicts between her and the heirs. Dress sales reached an all time low soon after in 1955, and the heirs were unable to keep the factory running. Ownership of The Shirt Factory changed multiple times after McMullen's heirs were forced to sell the building. Nathan Sheinman bought the building in 1956, and he moved the company's headquarters to New York City. The building was sold again in 1976, and dress production was moved overseas, leaving the company with the "Troy Shirt Makers Guild" label. The company went completely bankrupt in 1992, but in 1999, Eric Unkauf purchased the building and salvaged what was left of The Shirt Factory. As the current owner, Unkauf has witnessed The Shirt Factory's revival first hand. When Unkauf took control of the building and restored it, people began to ask him about all of the open spaces. For artists, the large windows provide the perfect amount of light during the day. Within the first year, The Shirt Factory had 20 tenants, and now, that number is about 100. The Shirt Factory slowly transformed into a place for artists to gather and work. Although most of the spaces are used for studios, Unkauf has acknowledged the building's storied history and portrayed pieces of the factory's past in its hallways. The rebirth of The Shirt Factory has been a communal effort because of all the in-house artists. Today, The Shirt Factory is a popular site for locals and visitors as well as a hotspot for creativity. 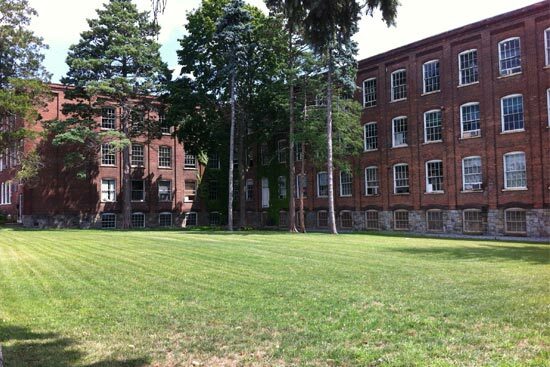 Clothing, pottery, and even tea shops all have a home at The Glens Falls Shirt Factory.